Slashed zero, the “right” way? The digit 0 in our documents, such as this one (external PDF link), is slashed “the wrong way” in source code blocks (lstlisting). How can we get it slashed “the right way” (from bottom-left to top-right) in the monospace font?? Bonus for also getting the zero in the regular (sans- and serif) text to slashed “the right way”. The TUGboat article linked by Barbara Beeton provides an in-depth study of the ambiguous-zero problem. In LaTeX's default typeface, Computer Modern, the zero in the typewriter font is narrow and round, as opposed to a squarish capital "Oh". But you may have your pick of other monospaced typefaces. The LaTeX Font Catalog provides a list of all the monospaced fonts that come with a full TeXLive distribution, so if you have LaTeX installed on any operating system, you can probably any of those fonts. Each page in the font catalog includes an image of the numerals. In most cases, as the catalog shows, you simply call a font package in the preamble. Most of the typewriter font packages only redefine the default typewriter family and so do not affect the other fonts in use. Dieses Programm geht davon aus, dass Du die Motoren mit den Anschlüssen A und B und den Sensor mit dem Anschluss 1 verbindest. Wenn Du andere Anschlüsse verwenden möchtest, musst Du das Programm entsprechend anpassen (wenn Du magst, überlege Dir, wie). EDITED to better demonstrate the technique, using txtt as the ttfont. Here, I show how a simple \scalebox can be used to invert the slash through a defined macro \0. 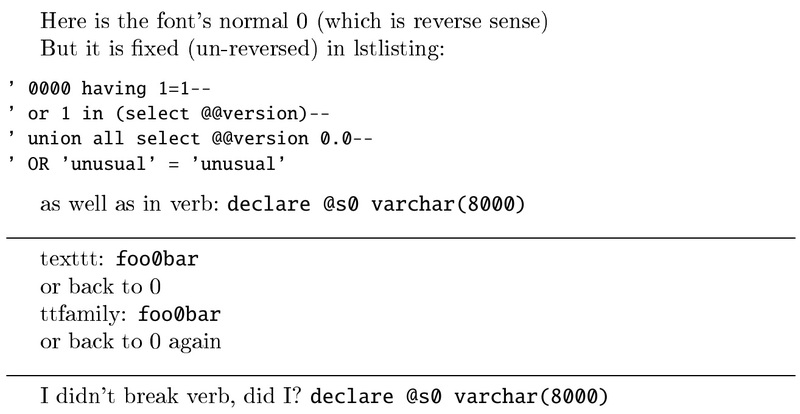 I also show how making the 0 active allows one to use the reversed version of the zero inside verbatim environments. Obviously, one would not want 0 active all the time, but turning it on for verbatim environments is a viable way to remedy the issue cited by the OP. 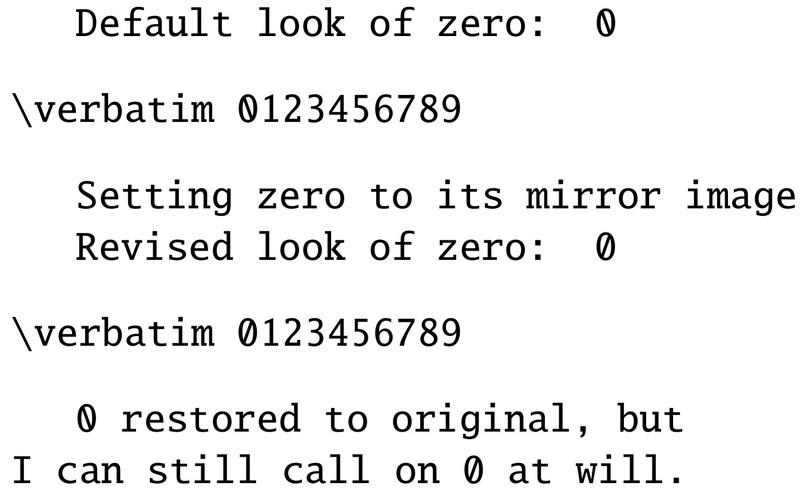 Alternately, in normal text, one could just invoke the reflected image as \0. I can still call on \0 at will. 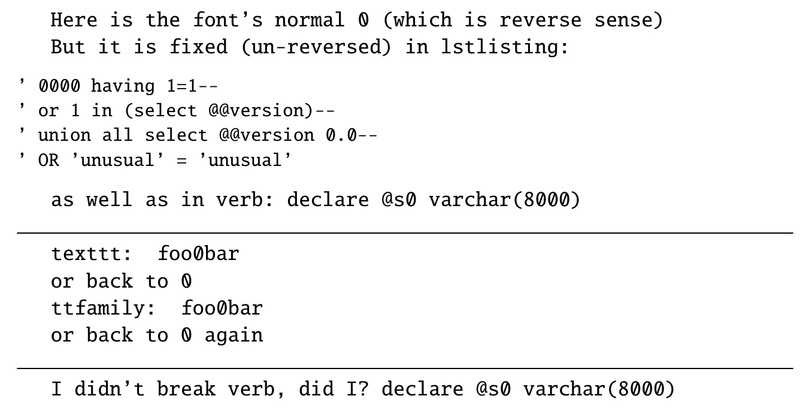 Using egreg's answer at email symbol while using package listings, I can automagically replace the reverse 0 with its mirror image in lstlisting (by using literate) and in \verb arguments (through a patch) as such. EDITED to fix \ttfamily and \texttt, as well. Note, though, that use of ttfamily should be grouped, or the active 0 could break other things. By commenting out the \familydefault redefinition, the result is basically what the OP is asking for: normal text unaltered in \rmfamily, but in listings, verbatim, ttfamily, and texttt, the reverse 0 is un-reversed. How can I create a full-size circumflex in typewriter font? What is the Right Way to install a new font locally? The right way to get sans-serif math? How do I change the standard “math font”? Using consolas as the default teletype style font for listings package? Is the command \underscore used in any packages? Is there a way to find all Cyrillic typewriter fonts on CTAN?